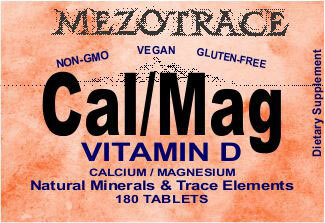 By popular demand, we have provided Mezotrace® with Vitamin D added. According to the National Institutes of Health, Vitamin D promotes calcium absorption in the gut and maintains adequate serum calcium and phosphate concentrations to enable normal mineralization of bone. Together with calcium, vitamin D also helps protect older adults from osteoporosis. Vitamin D has other roles in the body, as well, including boosting immune function, and reduction of inflammation. 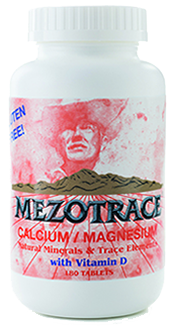 Mezotrace® is a 100 percent natural and unique mineral-rich carbonate compound with abundant calcium, magnesium and trace elements. It contains 11 of the known 17 essential minerals for optimum health, and 80 minerals altogether. 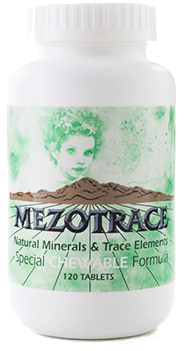 Mezotrace® is the most complete source of naturally occurring combinations and amounts of primary and essential minerals and trace elements (micronutrients) known to exist. Ingredients: MEZOTRACE Natural Carbonate Mineral Complex, Vegetable Stearate, Cellulose, Silicon Dioxide, Magnesium Stearate and Chlorophyll. *Amount needed in human nutrition not established. .. living without adequate levels of magnesium is like trying to operate a machine with the power off. And like a machine, it’s likely to malfunction. Our CORE Mezotrace product, with Vitamin D added.